Summary: 4.5 cauldrons. Comprehensive introduction to witches in Pathfinder's Advanced Players Guide, a feast of feats that expands character options for witches, spellcasters and for other classes as well as class builds based on three classic witch archetypes. DISCLAIMER: This review used a PDF provided by Open Design. Content: 4.5 cauldrons. Witches Brew takes a slightly different tack to Secrets of the Alchemist, introducing the witch class rather than assume prior knowledge. It focusses on versatility and parallels between it and the current magus playtest can be drawn. The witch offers a mixture of magics and this versatility makes it both powerful and a frustrating one for those used to narrow focus. The feast of feats here range from the witch specific (linked resistance) to those applicable to spellcasters (guarded casting) and beyond to any class (robust health). Sigfried Trent's capability in taking the feat system in different directions provides a GM will a toolkit from which numerous games can be woven - using item focus to create wizards with bejewelled tomes of arcane power for example. Some checks and balances will need to be applied and the facility to swap feats in and out as a character develops is suggested here to develop versatility without being tied to feat trees. There are a couple of feats that stand tweaking - seduction could eliminate it's overt sexuality instead cultivating favour and jealousy (like Sauron/Annatar in The Silmarillion) but if you're OK with wicked witches vamping it up, it'll do, pig, it'll do. The builds are classic witch. The arch-witch as tactical counterspeller, magical misdirector and wizardly foil is terrific, the white witch provides a flavourful healer/buffer and the wicked witch is just that. Another build would have gone beyond the classic poses and made this brilliant - maybe an elemental-based witch showcasing patron magics. Layout: 5 cauldrons. 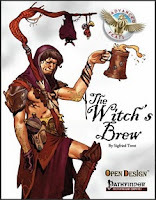 The cover art by Christophe Swal shows a cowled male witch bedecked with scrolls, tattoos and talismans, a sloshing tankard of ale and booted foot resting on a barrel of ale. A subtle challenge, evoking femininity without being feminine. Inside, magic circles lurk behind the text and all text is clear and readable. Bookmarks for sections enable efficient use and if Secrets of the Alchemist was a bit rough, this is polished smooth. In closing this is excellent stuff and for the price sets a high bar for PDFs to beat. Witch characters get new toys (familiars get a deserved boost) and their GMs have a lot of toys to play with. More like this please. That sounds like a cool book. Anytime you can get something classical into the books that really isn't well done is great. I agree on your additional builds part though, you'd expect a little more out of it than just the purely tradtional breakdown. It is a lot of fun. What impresses me about these are the versatility of the materials and for the price, these are seriously good value.